Strong Mind -Strong Business – is it that easy? Many of you know that the culture of The Business Cafe is the core driver to bring it to market. Friendship First, is not just a strapline, it is us. I have suffered enormous set-backs, loss of our home, self belief crushed, reinvention, anxiety and I think I teetered on depression. I needed friends to build me back up, not necessarily my social friends in my town, but those who knew me as a business-women and could make me believe in myself again. I love social media, all the positives, however, like it is for teenagers when they see their friends (appearing) to thrive and look so happy, I have found social media crushing at times. The appearance that everyone one is successful and so positive. When we are down and feel terrified about our futures, which we all feel at times, it is so hard to see the ‘Disneyland’ surface of everyone else’s lives. I feel the same way about listening to speakers, who rant “be like me and you too can be rich’. That does not serve me, it often seems to huge a gap. The reality is, like you, I am bloody brilliant at what I do, it took me a while to define that and focus on it, but I am proud of the things I am good at. But that does not mean things always stack in my favour, external situations of deaths, family traumas, financial grenades I was not expecting, they happen, I can’t control all external factors. When these things happen, does that make me rubbish at the things I am good at. If I was an awesome Graphic Designer, does the fact that a client refuses to pay their bill, (as they have cash flow issues), does that make me a rubbish Graphic Designer? If my mother dies, my dog is ill, does that make me suddenly useless. Of course not. Our skills are not defined by the unfortunate things that can kill our energy. While we move through our problems, we need to still earn, we are not paid when we are not working. getting our energy back and our mind strong is essential, but that doesn’t happen if all around us we appear to be the only person who is struggling. I am driven to help business people NOT feel the pain I have, isolation, lack of confidence and self belief. This means loving, supporting and helping them to have skills around business and their mental health, that I did not have when I needed it. I have learned over time to be a good business person, I now work with Gail Thomas as my Business Partner to ensure my Business is not disadvantaged by the things I am not good at. I have also invested time in getting skills that I need, and critically, I have accepted help when I had anxiety and learned to manage my mind and be happy and positive. We should not be afraid of our minds and the tricks it plays on us. We should not be afraid of telling others when we have a tough time and need love, support, more skills. 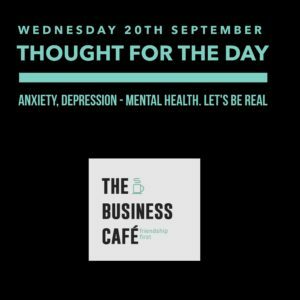 So the culture of The Business Cafe is to be a friend, to feel safe with others when you tell them you need help, and for none of us to judge the needs/challenges of others. Our campaign around this has not yet started. This is the page http://www.thebusinesscafe.co.uk/strong-mind-strong-business/ on our website that discuses it, one of the things I want to highlight is that this is an issue and we need to show one another that we are aware of it, not ashamed of it and that it is through us all recognising it and asking others to understand this that we can create change. We have so many great people in here that are trained and professional in helping with these issues. Let us all bring this to the fore, quietly, with dignity and with the knowledge that, it is okay, it can be a right of passage, and when we beat it and find the skills to have a Strong Mind, we can then have a Stronger Business that can survive most things, especially when friends are there for us. I have dared to add a Poll here, please do not feel any obligation to click, I don’t know how to make it anonymous, but in a way, why should we hide?